Organisers have said the Supreme Court’s refusal to revoke the ban on Jallikattu, Tamil Nadu’s bull taming sport, will affect thousands of farmers dependent on this breed of cattle for their livelihood. A winning bull can fetch a farmer as much as Rs 2 lakh. The apex court has dismissed petitions supporting the sport, among the oldest in the world, for this week’s Pongal season. 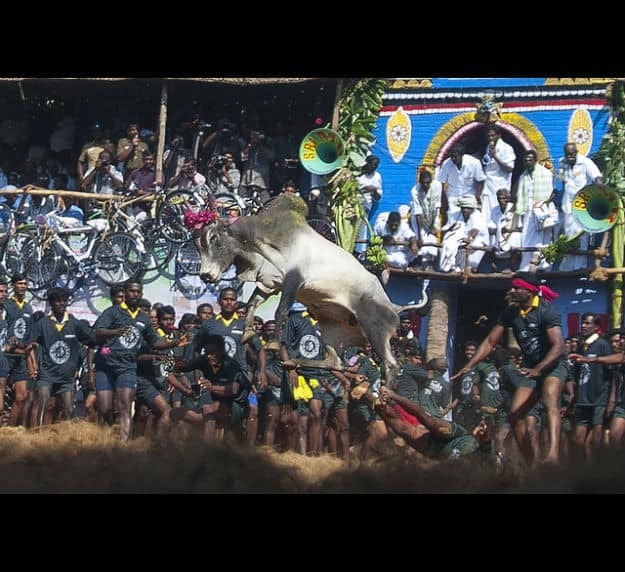 Tamil Nadu celebrated last week on news that the bull taming sport had been permitted. As preparations were on for Pongal, animal rights activists approached the Supreme Court seeking the ban be upheld. The court subsequently refused to stay its decision on a plea by the Tamil Nadu government. 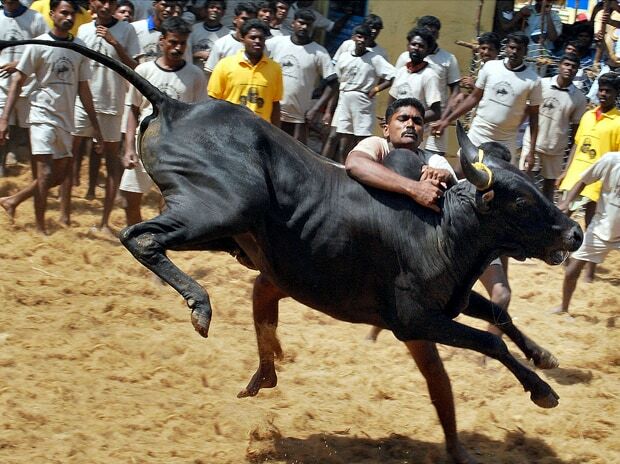 Jallikattu is organised in 24 places between January 14 and January 17 in Tamil Nadu. An event can raise up to Rs 15 lakh in a village, says Balakumar Somu, a member of a Jallikattu organising committee. A technology professional, Somu quit a job in Singapore, relocated to Coimbatore and started a website supporting Jallikattu. According to him, a farmer invests Rs 5,000-10,000 to buy a calf and his family nurtures it for 18 months into a healthy bull. Jallikattu is a platform to find buyers. 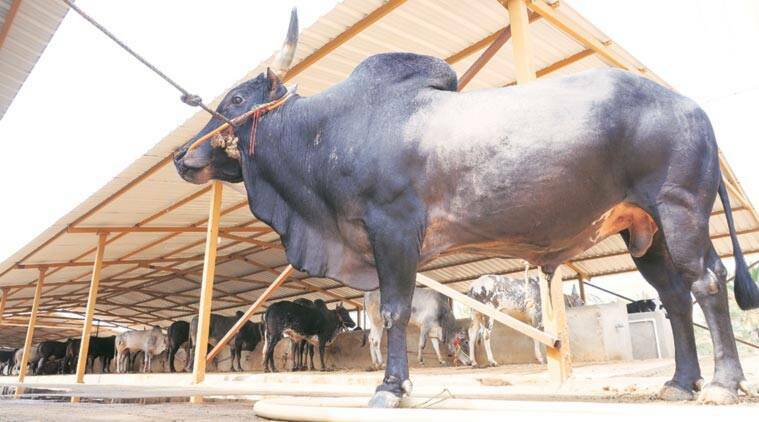 Bulls that win can fetch their owners Rs 1.5-2 lakh. The buyers are rich people who employ 5-6 hands to maintain the bulls. These hands, mostly women, are paid Rs 800-900 a week.The other set of people affected are artisans. In many villages a major source of income comes from creating decorative items, including special ropes, for the bulls and for the race. Jallikattu may be a three-day festival, but it is a source of income for farmers throughout the year, Somu points out. Organisers spend anywhere between Rs 50,000 and Rs 20 lakh to organise a Jallikattu. The money is spent on preparing the ground, deposit money and gifts that include motorcycles, gold coins, bicycles, steel almirahs, sheep and goats. Local brands advertise at these events and the merchandise includes coffee mugs, posters, coasters and bedsheets. A state government official says it is a myth that Jallikattu brings in tourism revenue. All shops and hotels are shut during the festival and most people at a Jallikattu event are from surrounding villages. The ban will also affect special cattle breeds used in Jallikattu, including the Kangeyam bulls. “The banning of Jallikattu will ultimately result in the vanishing of native species and the country becoming import dependent for bovine animals,” says Karthikeya Sivasenapathy, managing trustee, Senaapathy Kangayam Cattle Research Foundation. The foundation works on preservation of native cattle breeds. Sivasenapathy says the population of Kangayam cattle has come down from 1.1 million in 1990 to around 100,000 now. After animal rights activists successfully torpedoed Jallikattu for this year, by obtaining a stay on holding of the bull taming sport in Tamil Nadu, its supporters have begun to question the elitist stance of the urban educated and affluent sections of the society that remains silent on horse racing. Seeking a similar ban on horse racing on similar grounds of cruelty, Karithikeya Sivasenapathy, chief of the Senaapathy Kangayam Cattle Research Foundation (SKCRF) based in Tiruppur said that race horse breeders shoot and kill eight of the ten horse calves that do not make the grade of race steeds. The same animal rights activists, Peta, People for Animals or even Animal Welfare Board of India do not speak one word against horse racing because of the huge sponsorships, big money and high profile people involved with the sport, he alleged and charged them with an elitist bias in targeting the farmers and villagers who are often poor and unorganized and inarticulate. But the Jallikattu organisers are getting around this problem and have got themselves articulate English speaking faces. Software engineer Balakumar Somu is a member of the Tamil Nadu Jallikattu Peravai, Madurai, that organizes the bull taming sport in the region and runs a twitter campaign , we want Jallikattu. He lives and works at Coimbatore, though. Other youngsters like him are also coming around to articulate the feelings, sentiments, pains and problems of the farming community for whom Jallikattu is much more than a mere sport. Balakumar is blunt in questioning the very elitist bias in ‘targetting of the Jallikattu”. He calls for a ban on all sports that involve animals – whether it is horse racing or dog shows. “Ban everything or do not ban anything,” is his punchline as he holds forth on the attack against the rural, agrarian society from the MNCs through animal rights bodies such as Peta and Animal Welfare Board of India. Balakumar also has a problem with the media that dubs Jallikattu as barbaric and bloody. Has anyone seen the sport? They are just giving it a bad name and killing it, Balakumar said echoing the sentiments of several Jallikattu supporters. The animal rights activists never question horse racing or dog shows, where corporate bigwigs participate, Balakumar said. The same PETA never talks about temple elephants, some of which go mad and kill people, because of the inhuman treatment meted out to them. Balakumar or for that matter, Himakuran Anugula, author, researcher and cattle breeder based in Chennai, charge these elitist activists with targeting poor farmers and taking away their livelihood. They are not corporate farmers, they are landless laborers grazing cattle, by hitting at Jallikattu. This ancient sport is much more than a sport, he said, adding this is how the bulls are chosen for stud services. In villages, often the temple bull, chosen after Jallikattu, is used to service the village cows. The Jallikattu ban thus attacks the rural life in many ways, which must not be allowed, he said. Raja Marthandan, an XLRI management graduate and previously owning a transport business, has now completely moved into organic farming. Now 35, he has been into Jallikattu ever since he got a prized bull as a gift for getting 93 per cent in Plus Two examination, some 18 years ago. He does not see conspiracy theories like others, who see a sinister design of MNCs through animal rights activists in destroying Jallikattu, Marthandan certainly agrees that it has become fashionable to declare self as an animal rights activist. “Oh I saved a puppy today,” kind of activists never understand the many faceted Jallikattu and what it means to the people, he said adding Jallikattu is an event held to identify best of the breed of bull – all breeds are bred across the world on selective breeding – and later used to service the cows. It is the progeny of the Jallikattu bull that are used for work. Now the campaign for Jallikattu will become slicker, smarter and bigger, said another activist.